Product #20693 | SKU 1070-023-110 | 0.0 (no ratings yet) Thanks for your rating! The 1070cc HardBack Case with Laptop Liner from Pelican keeps your 13" Ultrabook safe from the bumps, drops, and scratches while traveling. It has non-skid rubber feet to prevent it from sliding when used on a slippery surface. The molded-in foam insert keeps your Ultrabook in place while the included shoulder strap makes it easy to carry. If you need to open the case, the easy-to-open latch makes accessing your Ultrabook effortless and painless. 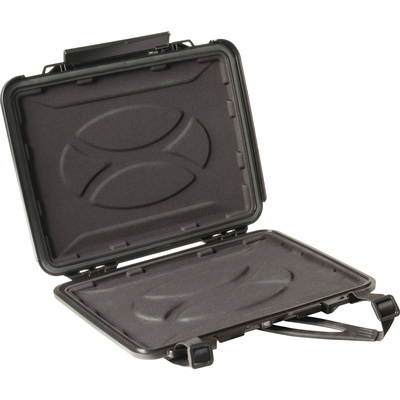 The 1070cc HardBack case is also watertight, crushproof, and dust proof for added protection.